That's not a sports report headline: we mean real bridges; magnificent engineering structures, soaring across waterways, railways, roadways, canyons and chasms of every description. We have been trying to keep off them lately: we confess there have been occasional lapses, especially over wet weekends when boredom has struck, but mostly we have been bridge free for some time now. Earlier today we were adding Peter Turner's excellent MaccCAM web site (the 'Macc' is for Macclesfield, a town in Cheshire, northern England) to the sidebar pulldown menu for UK CAM links. Routinely we checked for previous links, but could only find one entry, a piece about the Jodrell Bank radio telescope, also in Cheshire, England. Our memories are obviously beginning to fail; we would have sworn that we did another item based on one of Peter's galleries. To set things to rights we have featured the pictures we wrongly thought we had covered previously. 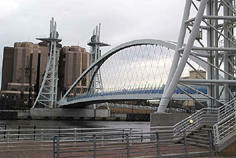 Peter went to Salford, a town that has always had to play second fiddle to the much larger conurbation of Manchester. When Peter visited Salford Quays he took the featured picture, which is the footbridge that links Manchester's Trafford Wharf with Salford's Central Wharf. Crossing between the bridge piers, which allow the central walkway to be lifted to allow boats to pass under, visitors will arrive at the bronzed glass of the Quay West building. The area was in decline for many years, but has recently been through an ongoing period of urban regeneration. Peter has 22 galleries online for 2003, so this web site is obviously worthy of your regular patronage: we do not understand why they have been so under featured here. We have also added Terry Smith's 'Interesting Trekking Scenes' web site to the sidebar pulldown menu. Terry's site is one of our regular calls, but another we have only featured once when we featured Terry's visit to Skipton's canal narrow boats. Terry's recent update was an archaeological adventure around Ingram and the Breamish Valley in the Northumberland National Park. Peter's most recent update was to record some of the architecture in Leek, another fascinating town in Peter's neighboring county of Staffordshire. Now we wonder how many more of our own regular destinations we have fecklessly failed to bring to your attention. A thorough check is in progress as we write. IDENTITY LINK: click the image below. French actor (1934- ). With a birth name of Pierre Richard Maurice Charles Leopold Defays it is little wonder he settled for something a little shorter when he began his career at the Paris Music Hall. This is one of those subjects from our French caricature supplier that may be more familiar to a Gallic audience: he is best remembered internationally in the 1972 French comedy 'Le Grand Blond Avec Une Chassure Noire' (The Tall Blond Man With One Black Shoe) directed by Yves Robert, who in 1967 gave our subject his first credited movie break in 'Alexandre Le Bienhereaux' (Very Happy Alexander). 'Grand Blond' was remade in the USA as 'The Man with One Red Shoe' 1985, starring Tom Hanks. Our lucky subject has just finished his latest project, in a movie starring Jane Birkin, whose notoriety in the 60s and 70s now seems tame rather than t'aime. He is also a wine grower with vineyards in the Corbières growing area of Languedoc. This entry was prepared using an IMDB (Internet Movie Database) feature. 1590 - John White, the leader of 117 colonists sent in 1587 to Roanoke Island (North Carolina) to establish a colony, returned from a trip to England to find the settlement deserted. No trace of the settlers was ever found. Not the best start to founding the most powerful nation on the planet. Visit the Reference.com page for today, where you will find a fuller listing of facts about this day, with sections for holidays, events and births. Fancy visiting the Tajrish Bazar in Tehran? Then pop along to the 3D Virtual Tours page on the Tehran24.com web site. When we visited recently the Bazar was the free download. The featured picture also comes from Tehran24.com, and we think that it makes a nice counterpoint to yesterday's picture from a rather less exotic location. If you have a larger monitor there is a bigger version of the picture (please allow time for the download). Are we being too woo-woo if we suggest that bridges have personalities of their own? There is a certain bridge across the Motorway M6 near Lancaster in the north of England that seems to us to be making a statement at very least. For all things concerning bridges, visit Derek Locke at Bridge Building - Art and Science. Next up there will be an exceptional picture from New Zealand for our daily update, followed by an equally splendid picture from Antarctica, as the blog tries to range further afield to bring you the best images from the web.